We are a tiny Napa, California winery crafting and bottling impeccable wine one barrel at a time. The name Calicaro is a mashup of California and Carolina - two places in our hearts and under our feet. We believe in bridging the gap. Coast to coast. People to people. Vine to wine. We are best known for our Pinot Noir. We make single vineyard designated Pinot Noirs from the Sonoma Coast, Santa Lucia Highlands, Anderson Valley and Sta. Rita Hills. Our Pinot Noirs typically are scored in the outstanding 90-93 point range by nationally known wine critics. We make several different styles and brand them to help our customers find their preference. Our Poinsett is our most elegant, typically based on Dijon Clone 115 fruit with limited use of oak. When young, it shows red cherry, raspberry and cranberry and palate refreshing acidity. The balance in this wine makes it age worthy - it will develop beautifully. "A huge Pinot Noir, superripe and exotic in raspberry and cherry jam, persimmon, cola, cinnamon, clove and sandalwood flavors. 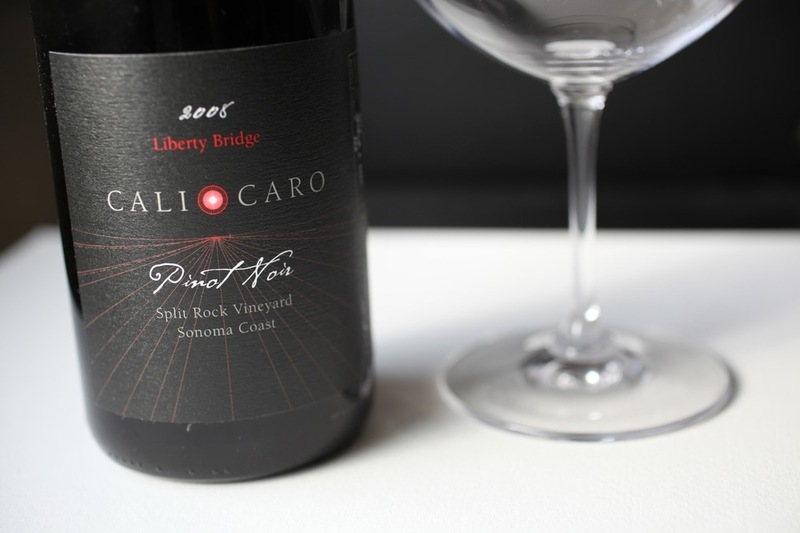 Defines the Sonoma Coast, with a crisp spine of acidity providing bright structure. Bold now, all fruit and oak, but has the balance to develop bottle nuance through 2015, at the very least." "Good structure in this Pinot, with firm tannins and fine coastal acidity. It shows jammy raspberry, cherry and cola flavors whose sweetness is echoed by the toasty oak." Our Liberty Bridge shows even darker and deeper notes combined with a more structured, tannic and acid backbone. It is slower to develop but gives enormous gratification for those who can cellar for a year or more. If you do drink this one young, we recommend a good decant to reveal the potential. This is our most expressive, big shouldered Pinot Noir. We designated our '09 as a "Best Barrel" wine. "Rich flavors of cherries, raspberries and cola, sprinkled with cinnamon and pepper. An exotic, powerful wine." Our 2008 and 2009 Charles Towne Cabernets were sourced from Reverence Vineyard in the southern region of Napa Valley, CA. This small vineyard is basically dry-farmed (they have to truck in water), strewn with rocks and has significant climate moderation from nearby San Pablo Bay. The result is slower fruit development in the vineyard, promoting mature, complex, intense flavors, with Brix still holding at 24-25.5. We typically are picking fruit here while getting ready for Halloween. The 2008 yield was 1.3 T/acre. Extremely low yielding! Elevage is in 100% new French oak for 22-24 months with an additional year of bottle aging pre-release. The '09 is designated Best Barrel, our version of a really special wine. "This best barrel selection is deep, dark and delicious, with classic Napa blackberry, currant and cassis flavors. The tannins are thick. There’s a fleshy, meaty mouthfeel, and the finish is dry and complex. Really impressive, but way too young. Give it until 2017, and it should provide great drinking well beyond that date." Our 2012 Zig Zag Alley Zin is from Grist Vineyard in Dry Creek Valley, Ca. Grist sits on top of Bradford Mountain, and is significantly cooler than the valley floor. This is perfect for us to make a balanced and elegant style of Zin for Pinot lovers. Grist is certified organic and the vines are old (40 year average) head pruned and gnarly. Not yet rated. Our 2010 Les Fauves Syrah was sourced from the highly regarded White Hawk Vineyard near Santa Barbara, CA. This vineyard is near legendary among cult Syrah makers.White Hawk is essentially a large drip irrigated sand dune with steep slopes and stressed vines producing small amounts of flavorful grapes. Damson plums, blackberries, black cherries, currant, molasses, dark chocolate. Try this with a bacon burger or other grilled meats. "With blackberry, currant, molasses and dark chocolate flavors, it seems like an ager, but may not have the concentration for the long haul. Try again in 2–3 years." We sourced our 2010 Savannah Viognier from Catie's Corner Vineyard in the Russian River Valley. Certified organic and in high demand, we were lucky to get a little bit of this fruit. We picked at the right moment and fermented in stainless steel. After about 7 months of aging and lees stirring we racked to a four year old barrel for a couple of months to impart a touch of oak. Luscious and mouth filling, with honeysuckle, peach, apricot and a bit of stony minerality. A subtle bitter almond skin note shows on the finish. "Lots of honey-sweet peach, pear, pineapple and buttered toast flavors in this crisp, clean Viognier. It shows the opulence you expect in this exotic variety." Carefully and gently, by hand, using gravity to move the wine, one barrel at a time (we typically produce our wines in lots of only 25 cases), sourced from North and Central Coast California sustainable or organically grown vineyards, with very low yields (1.5 - 2.5 tons per acre yield). or call us at 864.483.9972. The people behind Calicaro are husband and wife team Dave Ball and Phyllis O'Neill. In making our wines, we work with highly regarded growers and professional winemakers. We enjoy sharing food and wine with family and friends, traveling around the globe, cycling and sailing. Calicaro gives back, with joy and gratitude, through its support of several charities each year.